I've been back from Japan for about 3 weeks now. However, I haven't exactly been able to settle back into a routine. My house - the one we bought last year, but have been unable to work on until recently for various reasons until now - is in the throes of a major renovation, and is uninhabitable. So, we've been living in a small one-bedroom apartment in Aix-en-Provence. A beautiful town, but still it's not home. The shell of the house, built in the mid-19th century, is rock solid - in some ways literally so, since the foundations are rock. The basement is basically a cafe built into the rock. However, the work done fairly recently, by the former owner (who was himself a maçon, but apparently not that good) was pretty sloppy. So there was time wasted fixing those things. But the end is near....and we hope to move in soon. This is the very first house that I have been involved in from the start. Previously, I've either lived in rented places, or in places that have been around and finished before I moved in, like our previous place in Switzerland. I liked that house well enough...but it wasn't mine, if you know what I mean. This house is going to be Me as much as I can help it. Especially the kitchen. This is the current state of the kitchen. It's a shell! But it's getting there, slowly. I originally wanted to knock through one wall to connect a tiny room that was used as a bedroom to the main living space, to make one big kitchen area. But the wall turned out to be a load-bearing one, and when you're talking about an almost 200 year old stone built former warehouse, that's a lot of load. So the wall had to stay. That back room (with a new doorway) is now my pantry. It's an odd shaped room with a diagonal wall - another loadbearing one but it will do. I'm thinking about the whole house too, of course, but the kitchen is taking up most of my brain. What countertop material? How to arrange the cabinets? What kind of storage, and how much of it, do I need? Besides, I've been without a real kitchen of my own for more than 2 years now. 2 years of dealing with tiny, underpowered cookers in holiday rental homes and makeshift tabletop cookers! (And my mother's kitchen in Japan...but it's my mom's kitchen, not mine.) I'm kitchen deprived. Submitted by maki on 2011-07-13 21:16. Put in at least twice as many power points as you think you'll need. And put in as much storage as you can fit. You will fill it. As for the rest - it's hard. I started with the stuff the cabinets were made from and went from there - once you choose one thing it narrows down the choice of others that will go with it. I ended up having very little choice indeed as to floor covering, because there was bugger all that would go with the benchtops and cabinet stuff, and virtually no choice as to wall covering. Doing it again I think I'd start with the floor. 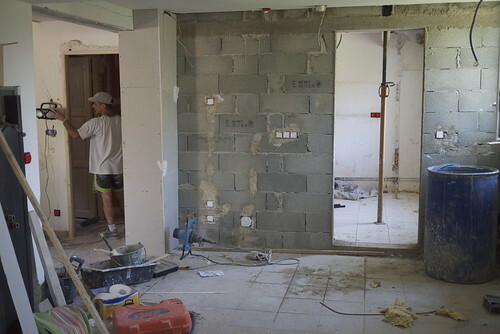 BTW, it looks really odd seeing houses being built with concrete block interior walls! Here in New Zealand, and I'm guessing in Japan, all of our house walls are wooden-framed and hollow. If we have brick, it's a single layer of them as a veneer over the top. Something like that solid wall would shatter to bits in an earthquake! How do they get the wires and pipes and things through it? And what happens if you want a new power point or something? I can't see them being able to get under the house and drill holes up through the walls very easily. Stone and concrete construction is traditional for building here - heck, the Romans used both (and this village is just littered with Roman structures, as I mentioned earlier). We don't get earthquakes here, though we do get floods. Houses are build with thick stone (or concret block) walls, which insulates against the hot weather and keeps the interiors cool. Our exterior walls are about 50cm thick! The building blocks have channels in them in which wires, piping and stuff can go through, as well as supporting steel beams and such when needed. They also drill holes as needed (we made some mistakes with the electricity layout, especially in the kitchen, and have way more outlets than we need ^_^;) I'm actually more amazed at the fact that the plumber was able to drill through solid rock, to put in a new pipe we needed! The house is basically partially built into a solid rock base. "is in the throes of a major renovation, and is inhabitable." I think inhabitable means fit for habitation. If I read the context right, I think uninhabitable would be more suitable. Anyway, I hope you're doing well and good luck with your house. I know what you mean - I want to redo my kitchen a bit. I love it and I'm glad to have it but I just want to improve it a touch. ^^ It seems like you'll have a pretty big pantry for all of your goodies when it is finished. Having setup my own kitchen a year ago(not a full remodel just new cabs). Went with IKEA... Basically go for pullouts on the floor cabs. It avoids having to dig around in the back of cabs for stuff. Also consider some bottom cabs for the pantry if you can fit them. Helps to store various small bits and other things easily without them getting lost. As for how much of storage. Basic kitchen needs around 4 pots and pans. But you know your own use pattern most. Look at the pots and pans you have take those that you most commonly use, add a couple of extra that you also might be using. Store or better yet throw away the others. Another point how much cutlery, plates etc... do you need... if only for two then make it two of each plus one - store the rest. If you want a bit more lee-way go up to 5 of each. The other supporting/to store food containers - if you can filter it around a bit. There is only so much you can store into a fridge/freezer. Box the rest or something and store it in the basement. Not sure if you picked a cooktop yet but ever since I switched from gas to induction I've become a bit of an induction evangelist. It's great tech and if you have pots/pans that can be used on it(or still need to buy them) go for it. It makes cooking an easy and actually a not messy setup. Nothing gets charred or burned to the cooktop, most cleaning is just wipe it down and there is an added benefit... no more atomisation of oils -> no more kitchen grease covering every nook and cranny. Usually by digging up the wall and laying a new channel then sealing it back up(you can actually see this on the power points in the pics as well). This tends to be a rather common construction setup in Europe. Though the drywall approach and such is being used in a lot of new construction. Goodness, you are a minimalist. I live alone and I have at least 11 pots, 8 frypans, about 15 bowls, half a dozen casserole dishes, 2 pressure cookers, various specialised cooking implements etc. Plus two every-day 6 place dinner sets, one 24 place dinner set (very inexpensive, it's 6 identical cheap 4 place sets that I use for parties, and cost all of $100), my grandmother's old 6 place dinner set, and my aunt's old 8 place Royal Doulton one. Add to that miscellaneous sets of 6 plates of various types, such as pasta plates, soup bowls etc, cups for varying sorts of coffee and tea in sets of 6 or 12, and glasses for all sorts of drink in sets of 12 or 24. My kitchen cupboards are all quite well filled. Believe it or not, they do all get used too. Not often though, I have to admit. I'm a bit extreme (I have this compulsion to have matching sets of things), but if you have a dishwasher you should have enough plates etc to fill it. That's the beauty of a dishwasher, you store your dirty dishes in it until it's full before washing them. It's an awful waste of resources to put a cycle on that's not full. Not really. We do have more pots and pans and a lot more plates etc... But just examining what actually gets used we could store a lot of the things. Also note we have a TON of Tupperware products and those take most of the storage. We also have a lot of various sized bowls and a ton of drinking glasses. Hmmm we have a 32cm wok, 1 pressure cooker, 1 pasta pot, 4 pots, 3 pans, one crepe pan. That covers 99% of our use. For plates we have 2 huge ones flat, 6 large ones, 6 medium, 6 small and a bunch of tea cup ones. As for the dishwasher believe me it gets full before running(it's only a 45cm wide one). But consider this... One bowl, two pots/pans, a few plates, a lot of glasses and cuttlery. And that more or less fllls up the dishwasher(approximately of course). We did ground up construction in San Francisco a few years back...i totally understand the term 'obsessively obsessing'. After the intense focus, however, i am happy to report that for the first time ever.....i love my kitchen! It is quite efficient and clean up after a dinner party literally takes me about 15-20 minutes. - Two dish washers...i know sounds extravagant but after researching we found that the cost is less than the price of cabinetry. Cooking is continuous so one washer is always clean while the other is ready for dirty loading. - In wall steamer. Being Japanese....rice...has nearly been a daily requirement. My Miele streamer is simple to use and makes perfect rice. Of course, steamed veggies...beautiful and better yet, perfect chawan mushi and steamed fish. Think about it....intant increased counter space...no more rice cooker sitting out. -Pull out pantries. Hafele makes them. I have 2 pull outs which are only 12 inches wide but include 6 adjustable sturdy wire shelves. Benefits - easy access for short people, ease of visibility with wire shelves, easy organization of small package food items such as many asian ingredients, sturdy enough for oil bottles, shelves adjustable to accomodate dry pastas stored upright. -In cabinet vertical dividers. For storage and easy access of cookie sheets, large serving platters etc. - Dish storage - consider sturdy drawers with peg dividers. Yes, they make drawers now that can handle major dish weight and are not difficult to pull out. Much easier to deal with than crawling into the deep recesses of a cabinet and unstacking dishes to reach that favorite serving bowl. -Appliance garage - if you have the space. Great for keeping counters clear and still have easy access to daily appliances....toasters, etc. Oh....i can go on.....see what i mean obsessed!!!! Enjoy the process! What great ideas! We're just beginning to renovate our kitchen, so I'm in the process of deciding all sorts of things. A couple of the ideas you mentioned are just brilliant, I hadn't even heard of them before! I'm assuming that things like the built-in steamer aren't too hard to come by in America? Thanks! First off, good luck with the renovations & setting up your kitchen! I'm still quite frustrated myself with the kitchen I got in my new (rented) apartment but I hope one day I'll have my own house and own kitchen too! I'm asking you this because we are also considering settling down in a town like Vaison-la-Romaine (I was actually born in Avignon and grew up in a village near St Rémy de Provence) and possibly work from home (we've both been working in the Internet business for a few years). It would be great if you could share some of your experience with me! Hi Cécile! Well we both work remotely via the internet most of the time. I am primarily a writer these days (writing for my site, and for others, plus my book of course) and my husband is a consultant and programmer type with clients all over the place. I SO understand this. My husband and I are almost done on a major renovation of an 80-year-old house in Brooklyn. I obsessed about the kitchen because I wanted it to be truly mine. We kept the original cabinets but nothing else. Slate floor, quartz countertops, a granite-composite sink and a super modern faucet! And all-new appliances! Including a DISHWASHER! I've never had one before, and consider it a miracle machine. And we added a custom-made island. I love my kitchen so much--and cooking is so much more fun (and easier) now that everything is exactly the way I want it. There's not one thing I would change. The best part: our range is vented outside! I can cook in a wok at super high temperatures and the house doesn't get all smoky! I can grill on my stovetop! I can roast a chicken at 450 degrees fahreheit! Enjoy designing everything! You'll never regret it. Have you seen these Maki? http://www.fisherpaykel.co.nz/product/dishwashing/dishwashing/ They're great. I adore the butcher block countertop in my kitchen. It gives a very homey/warm/country/timeless feel. Looks great with white cabinets with clear glass window. I think it's so much more unique than the granite countertop that everyone else upgrades their kitchen with. We have renovated kitchens in nearly all our houses, using ideas from a British kitchen designer, Johnny Grey (who happens to be Elizabeth David's nephew). I love his concepts of open shelving, kitchen dressers and plate racks, so all your everyday things are to hand. The last renovation we used composite stone bench tops (like Caesarstone). It is the most beautiful, versatile and easiest to clean of any top we have had. We also had an island with built in chopping block and dedicated sink for for veggie prep. I would have loved to have a walk-in pantry too! It turned out lucky for you that you were forced to have it! Happy cooking...a wonderful kitchen is essential for a serious cook! I can't wait to see the finished kitchen Maki! Hope you will post photos once it's completed. I know I'm a bit late coming to this article, but my biggest kitchen suggestion would be a single basin sink (as in, not divided into two smaller bowls like most sinks are). Our neighbor has one and recommended it and we just got one. It's awesome. I can fit even the biggest pots and pans and cutting boards all the way in to soak, and they don't splash water everywhere by hanging halfway out of the sink. We do all the smaller dishes in the dishwasher anyway, and if we want to soak something smaller, we just use a bowl. Really recommend. Also, I'm a big fan of soapstone counters. You can sand out any chips yourself, and it doesn't stain as easily as granite or marble. But that's more of an aesthetics issue. I dunno, I think it looks like a shell with a lot of potential... I look forward to seeing the big reveal! I'm an Asian-American who grew up in California with brief stints abroad (not Japanese however) and then landed in Switzerland by chance too, but spend half my time these days in London working. 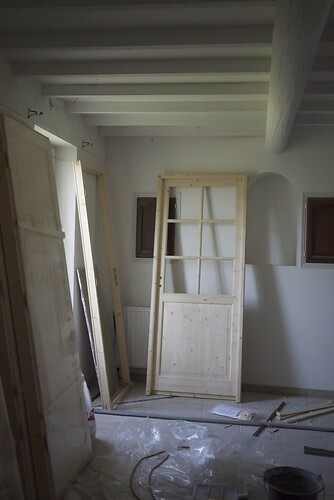 My partner and I just bought a modest apartment on the French border with Geneva- not quite the 'final destination' home yet as you've arrived at, but likewise still a lot of planning and obsessing to work through! I'm glad I'm not the only one daydreaming about cabinets and bathroom tiles all the time. My partner is French and our first trip together was a long-distance cycle tour through Provence- just gorgeous, and so easy to grow just about anything; you'll be stocked to the hilt with lavender/coriander/shiso and just about anything fruit/veggie you can grow outside your window (and succulents!). I really like the French 'updated rustic' take on the home, especially in Provence - chic and earthy, and not dowdy like some US takes on 'country' living. You'll probably have a second kitchen outdoors in no time to profit from the magnificent climate. Maybe two sinks, or two ovens if you have the space (inside)? It's kind of nice to work on an island while other stuff is going on by the main wall, or to cook in tandem with your spouse or guests. Depends on if you plan on built-ins or modular stuff, but either way, can't wait to see the finished work and looking forward to all the inventiveness that'll come from your new kitchen life. I discovered Umai (the sushi factory?) by chance last week while wandering down Regent st. I loved the shop and loved seeing your Just Bento book there. I wish there's something like Umai in my town. Hope the kitchen renovation is going well!! I wish i could have a huuuuuuge kitchen! I'm a student in Denmark and live in a small apartment (45kvm) and my kitchen is literally two cooking plates/hobs a sink and approximately a kitchen counter (if you can call it that) of 45cm x 60-ish cm...... need more space! Good luck with the homebuilding project!